Weight training after 60 offers numerous benefits in addition to helping you look better, feel better and function better. 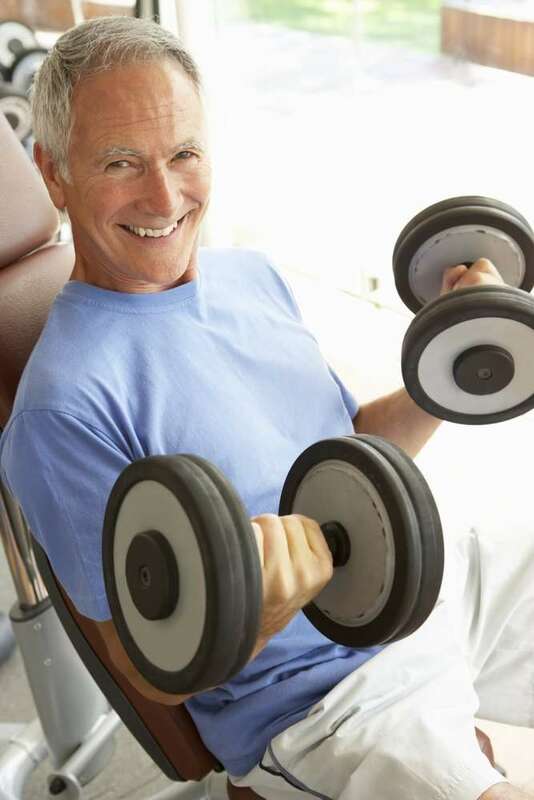 In addition weight training helps minimize declines in metabolism and muscle strength that occurs with age. It also increases bone mineral density and decreases resting blood pressure to reduce the risk of developing hypertension. The testosterone levels gradually decline as men age. When a man reaches 60, he has significantly reduced testosterone production, which diminishes his ability to maintain muscle mass. But don’t worry, we have good news for you! Men over 60 can rebuild lost mass, improve strength and regain joint flexibility. Weight-training is a proven way to offset this natural phenomenon. As we age, our joints don’t remain as limber as they were in young age. The risk of inflammatory pain and injuries increases, and stamina can often decease. (i) To begin with do simple exercises that can be done while seated or in a supine position. This way you can ensure that the stress of the resistance hits target muscles more completely. Moreover this reduces the possibility of injuring joints in other parts of your body. (ii) Also at start do those exercises that engage a minimum number of joints. Examples are arm curls, bench presses, leg curls, leg presses and shoulder presses. This way you can reach many of the main muscle groups in both the upper and lower body. As you progress through several weeks, include more complex exercises such as bent-over rows, lat pulldowns and triceps pushdowns. (ii) Split your routine into upper- and lower-body workouts on different days so that you don’t overburden yourself. (iii) Quality movement is a LOT more important than poundage. Do your exercises slowly and methodically. Avoid using momentum while you workout as this not only reduces the benefit, but will cause serious joint and muscle injury for those over the age of 60. (iv) Perform each exercise in its correct form, and use a low level of weight until you’re completely comfortable performing the exercise. Don’t attempt to max out on each lift; the purpose isn’t to blast your muscles. Because when you perform exercises with weight heavier than the one you are comfortable with, your body will need as much more time to recover. Gradually you can start increasing weight, as your stamina and endurance will improve with exercises. (v) As you age, you need more and more rest than you used to. So rest two days in between each workout for the same muscles. For example, perform your upper-body workout on one day, then your lower-body workout next day, and then plan a complete day of rest before doing your second weekly upper-body workout, followed by your second lower-body workout. I personally perform one part of body workout on one day and then another part of body next day and so on. I work on chest, back, biceps, shoulders, triceps and thighs (six body parts) – each on different days in that order. Then I also make sure to take 2-3 days rest in a week in between on the days when I am busy or feel like taking rest. (vi) Warm up fully before you start working out. The warm-up’s not just about getting warm; it’s also a self-assessment of sorts. Observe what your body’s telling you in terms of stiffness, soreness, energy levels, etc. (vii) Listen to your body. Just because you could do it at 25–or at 50–doesn’t mean you can do it today. Enjoy and follow the above tips about weight training for over 60s. We will appreciate if you could share your experience with our readers here under the comments section below. Listening to your body is super important! I’m 60 I do weight training. I do my body parts once every two weeks i.e. chest, tri’s & delts week one then back, bi’s & legs week 2. I never spend more than 40 minutes in the gym. CV is covered with walking my dogs. I take a protein drink post training. My nutrition is my only letdown I like sweets to much, but this year so far I’ve cut as much sugar out of my nutrition as I can without going on a diet. So far so good.